This cleverly designed puzzle is in effect a combination of the Equator puzzle and the Rubik's Cube. It is a ball with three intersecting rings of moving pieces which divide the remaining surface of the ball into eight triangles. There are 12 square tiles each ring, making 30 pieces in all because there are 6 places where the rings intersect. There is no space so the pieces do not move singly. Instead, all 12 pieces of a ring can be shifted as one just like the Equator puzzle. Furthermore, a cap consisting of 4 of the triangles and the tiles between them can rotate. There are various colour schemes for the Mozaika puzzle. 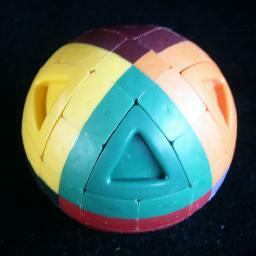 The most difficult version, the Offset, has 8 colours; each octant of the ball has its own colour. Therefore the 6 tiles which lie at the crossings (the intersections of the rings) have 4 colours, all other tiles have two colours, and the triangles have only one. Other patterns include the Quad, which is coloured just like the Equator, or the Half which simply has two differently coloured hemispheres. Note that the patterns can also have some colours duplicated to make it easier. I will only discuss the 8-colour version. The Mozaika was invented by Rudolf Destics, and patented on 22 October 1996, US 5,566,941. This leaves 8!·30!·430/(24·213) = 62,716,115,731,979,958,427,000,055,726,386,372,096,819,200,000,000 or 6.2·1049 positions. A similar notation as the cube will be used. Hold the puzzle so that the rings intersect at the front, back, left and right. Denote these 6 crossings by the letters F, B, L, R, U and D. A clockwise quarter turn of the cap around such a crossing is simply denoted by the relevant letter. Half turns and anti-clockwise quarter turns are denoted by the relevant letter followed by a 2 or an apostrophe (') respectively. A clockwise move of a ring of tiles is denoted by a lower case letter indicating its adjacent cap, followed by a number indicating the number of tiles to move the ring along. For example u1 means rotate the ring around the equator westwards one tile, and d1 means rotate the equator ring eastwards one tile. The positions of tiles can be denoted by a combination of letters: The crossing points by a single letter (e.g. F for the front crossing point), the other tiles by two letters (e.g. FD, FL, FU, FR for the 4 tile positions adjacent to the front crossing point; don't confuse FU with UF etc.). In this phase the tiles with 4 colours will be placed in position at the intersections of the rings of tiles. Their orientation is not important yet. Note that when the 4-coloured tiles are correctly positioned, each should have 2 colours in common with the 4 nearest 4-coloured tiles, and none with the tile on the opposite side. Move any ring to place one of the 4-coloured tiles at a crossing point. This tile is considered to be correctly placed. A second 4-coloured tile can usually be placed in position by twisting the ring that does not contain the first tile. Find a 4-coloured tile that is not in its correct position. If it lies at a crossing point, then hold the puzzle so that the piece is at the front and do b1 u1 F d1 f1. Turn any caps to bring the 4-coloured tile next to the crossing point where it belongs. Hold the puzzle so that the crossing point is at the front, and the 4-coloured tile below it (at FD) and do b1 u1 F d1 f1. Repeat the above steps for each remaining 4-coloured tile. Phase 2: Orient the 2-coloured tiles. In this phase each 2-coloured tile is given a quarter turn if necessary so that the line dividing its colours runs along the ring it's in rather than across it. In other words, one of its colours is adjacent to one triangle, the other colour is adjacent to another triangle. Find a tile that needs a quarter turn. Hold the puzzle so that the tile lies at position FD. Do the sequence r1 d3 R u3 l1. Repeat steps a-c until no more tiles need twisting. Use any cap moves to bring tiles that need twisting at the positions FD, BU, FL, BR. Note that these are two antipodal pairs. Similar sequences can be used to twist any two antipodal pairs. Phase 3: Pair up the 2-coloured tiles. In this phase each pair of indistinguishable 2-coloured tiles will be brought next to each other, preferably in the same orientation. Hold the puzzle so that one of the tiles lies at FD. Do the sequence r1 u6 l1 to bring them together. (Note that this will move the 4-coloured tiles around but that will be fixed in the next phase if necessary). Repeat steps a-d until all 2-coloured edges are in pairs. Phase 4: Solve the 4-coloured tiles. The previous phase may have disturbed the 4-coloured tiles, so that will be fixed now. Turn the U and R caps so that the 4-coloured tiles at U and R are in the correct orientation relative to each other (i.e. the two colours they have in common are nearest to each other). Turn the D and L caps to orient their 4-coloured tiles. You will probably have tile pairs which are not oriented properly with respect to each other. Treat these like any other proper edge pair. Note however that the orientation of this pair treated as a single 'edge' is not visible. You may find that two edges (tile pairs) need to be swapped in the end, which does not occur on a normal cube. This will be fixed in the next phase. You may find that one edge (tile pair) needs to be flipped in the end, which does not occur on a normal cube. This will be fixed in the next phase. Note however that you might flip such a 'single edge' in combination with a tile pair that are not oriented properly with respect to each other. This can usually get rid of any apparently single flipped 'edges'. If you use an edges first method, or a layer method in which the final layer is solved edges first, then in the end you may find you have two corners (triangles) which need to be swapped. In this case swap two edges and solve the corners again. To turn the F tile 180 degrees, do R L F2 R' L' F twice. To turn the R tile clockwise 90 degrees, and the U tile anti-clockwise 90 degrees, do l3 u3 r3 U l3 d3 r3 U'. Now you may still need to swap two pairs of tiles, and will almost certainly need to orient a few of the 2-coloured tiles. To swap the FD/DF pair with the FU/UF pair, do U2 r1 u6 r1 u6 l2 U2. To swap the FD/DF pair with the FR/RF pair, do R2 B r1 u6 r1 u6 l2 B' R2. All tiles that need to be flipped can be corrected in this way. Note that if you have a single 'flipped edge' from the previous phase, then you can flip the two tiles separately. Compare this sequence with the sequence used in the previous phase to rotate the F tile 180 degrees.